Yes this looks outstanding, the best kephart reproduction I have seen. Quote from Sarge: "I'm pleased with the overall look of it but I need to tweak it a bit. 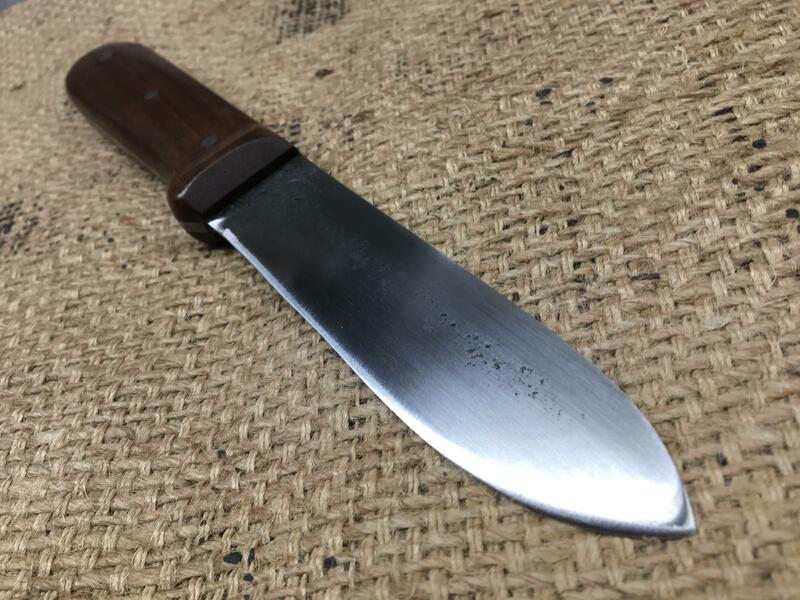 This one has a 4 3/4" blade and a 5" handle. 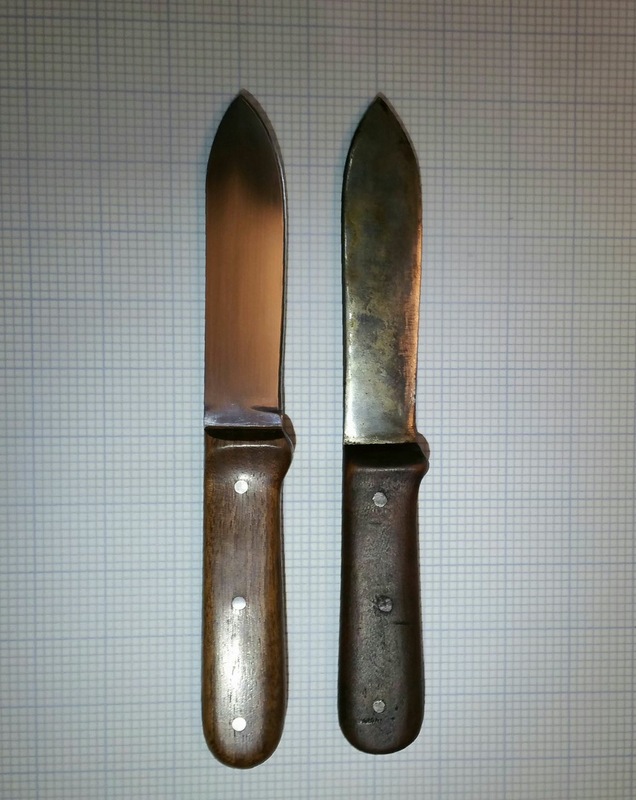 The original has a 5" blade and a 4 3/4" handle. That's an easy fix on the next one. The pinch point on the original is more subtle than this one. I also need to work on the convex grind." 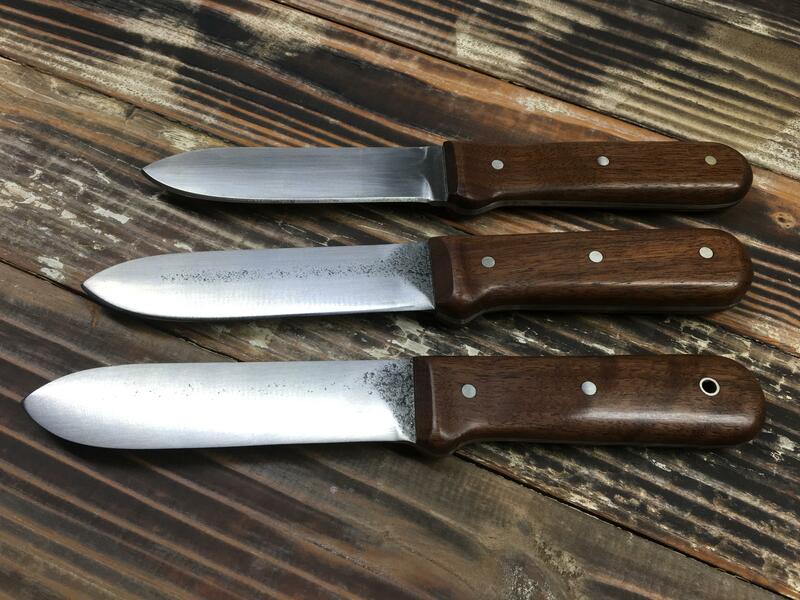 Wolfy: I think you did a GREAT job on the prototype and I would be as happy as a pig in a mud puddle to own it, but like you said, "The original has a 5" blade and a 4 3/4" handle." I also see what you are saying about the deeper than 'original' pinch point. I dream of a 5" blade and 4 3/4" handle because I like a little extra length in the blade for reaching the bottom of the peanut butter jar .......and my hands aren't really that big, so the shorter handle would be better, too, I think. Looks fantastic! 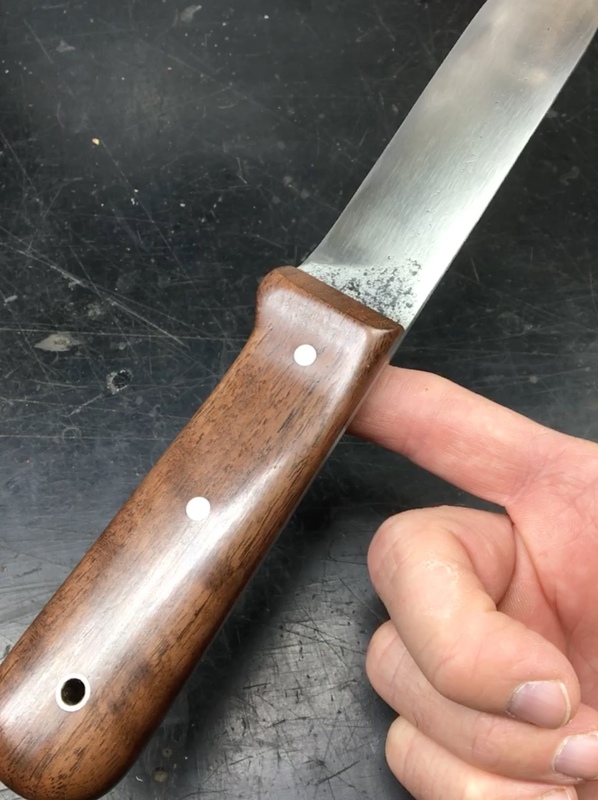 I can appreciate the desire to tweak and tune things here and there, but that knife is probably the closest thing to the original to have been made in many decades. Well done! "Much wiser people than I have said it best." 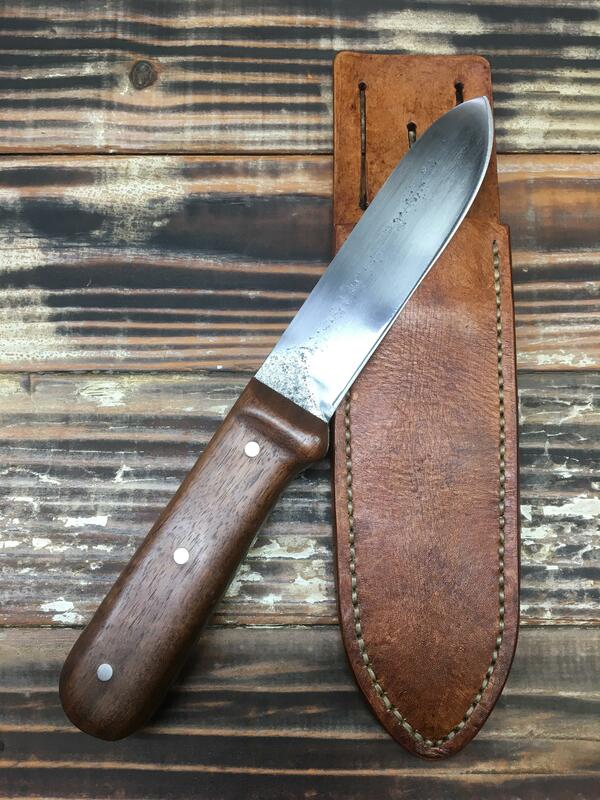 All it needs now is a well made Kephart sheath. Looking great, Sarge! I have ground a few distal tapers and quite honestly, could not really appreciate the effect if produced. Years ago, I bought a machete at the local Academy store. It was made by Collins Axe and the machete blade had a distal taper. The effect was that the blade bent in a smooth arc from the haft to the tip. The practical effect was to lessen the impact on the wrist of flexing in use. 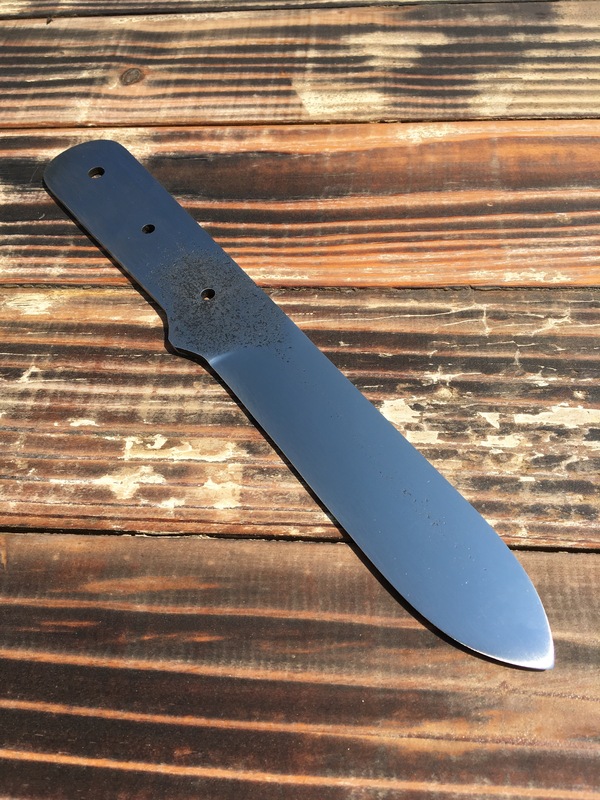 I have never found another machete made that way. Good luck Sarge. Darn, sorry I missed the pics before hosting crapped out. So would that make it a proximal taper? Sorry about that... I feel better now. Not much knife time recently but I'm still working on this project. Here are some re-posted pics of the first attempt in case you missed the pre-hijack photos. I was pleased with the overall looks but I missed a few subtleties when compared to the original. I left the blade too thick on the lower bevel and put a secondary bevel on the cutting edge. Nice balance but I took too much wood from the pinch point. My overall length was close but my blade was a little shorter and my handle a little longer than the original. I cut out 4 blanks from a sawmill blade and am currently working on my convex grinding. 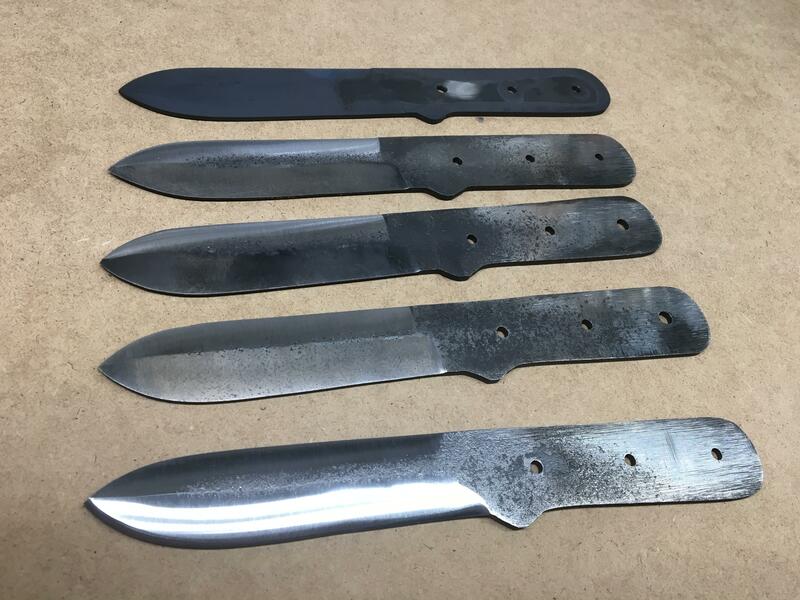 The top blade is O1 tool steel. I'll work on it after I practice on the 4 saw blade knives. With the first sawblade knife (in the foreground), I removed more stock from the lower bevel so the convex is thinner and the cutting edge is closer to a zero convex. It already cuts better than the first edition with the thicker convex. I also tried the soften the plunge lines on all 4 bevels. Thanks for the update Sarge. Keep on keepin' on, Sarge.....I'm lookin' over your shoulder, but don't be nervous! looking forward to seeing some of these in 5 weeks! Took about 30 min for my phone to load them, but it was worth it. Sarge, I think you opened Pandora's box! How is it you can do a side by side with the original? I thought Mr. Becker had it. That's a good question........... ...OR, maybe Sarge has actually created an EXACT reproduction and is trying to decide how much he's going to scalp us for one! I think that is the first one he made and that photo was taken when he met with Becker to show it to him. Yes, that is a pic of the first one I made beside the original. Mr. Becker was nice enough to allow me access for a side by side comparison and offer his critique. I knew that......I was just being a smarta$$. 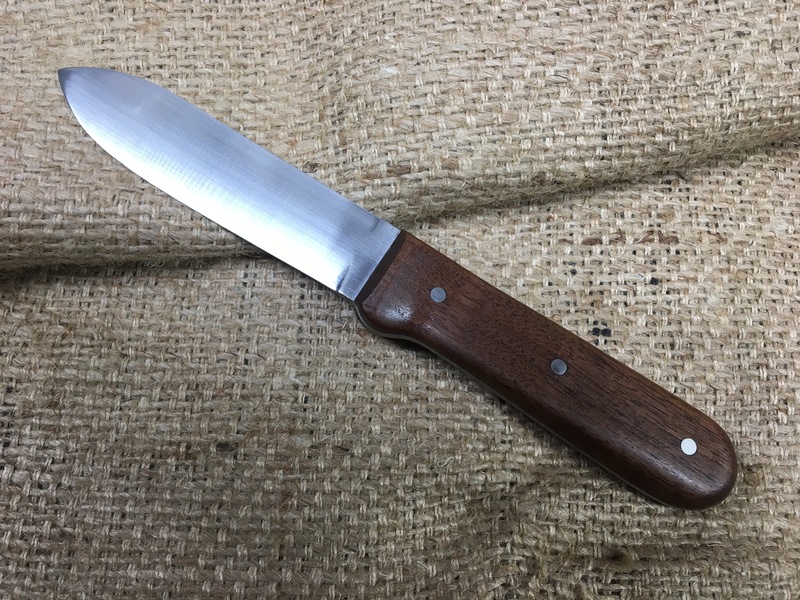 I've finally finished knife #2 (1st of the 4 sawmill blade blanks). I got a step closer to where I want to be. 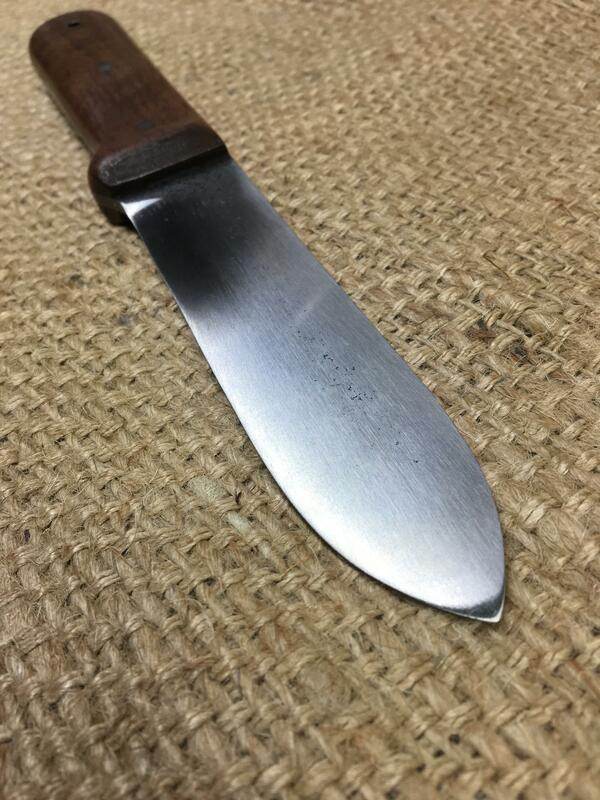 I increased the blade length to 5" and shortened the handle a bit to more closely match the dimensions of the original - approximately 5 + 4 3/4 = 9 3/4" OAL. I softened the plunge lines - still not perfect but better than the first. The convex grind is better on this one also. I thinned the lower bevel down and got closer to the zero convex. This greatly improved the cutting performance. It's a hair-popping, paper-slicing, wood-shaver! Changed the shape of the scales a bit. I left them a little too thick but they were a little too thin on the first one. This one feels better in hand. This one weighs 7 oz. (same as the first one). The original weighs in at 5 oz., so I need to lighten the next one up a couple ounces. Made a Kephart style sheath for this one. Great work Sarge. These are really something special to see evolve. It appears that you are really getting some good techniques developed. I am enjoying this a great deal. I just now found time to view the forum tonight and what to my wondering eyes should appear, but an even closer rendition of the original Colclesser/Kephart! I'm ecstatic that you adopted this particular pattern to replicate, Sarge! It's like watching an orchid bloom.....to me, anyway! I don't know that I will ever own one of these but I truly appreciate the work & attention to detail you are putting into making them as close as possible to the original. This is really a great project to watch. I think you should make a pile of them and work out a deal with a publisher to include one with Kephart's book. That is just plain AWESOME Sarge! Loving it! Any news? We MUST be gettin' close.....I'm startin' to fidget! Buy one of them spinner things. Then you can fidget all you want. 2 are complete -- I got to handle both this weekend, and they're nice. 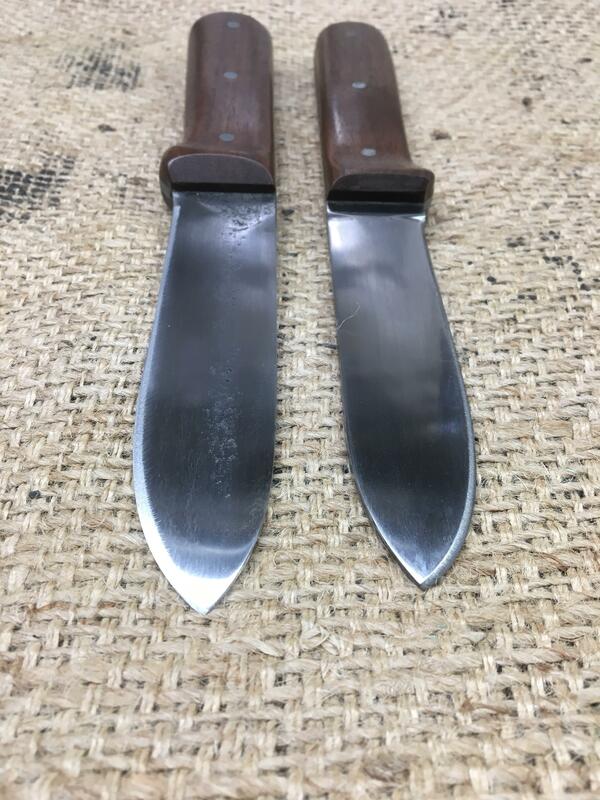 both of them have very well-made sheaths, as well. 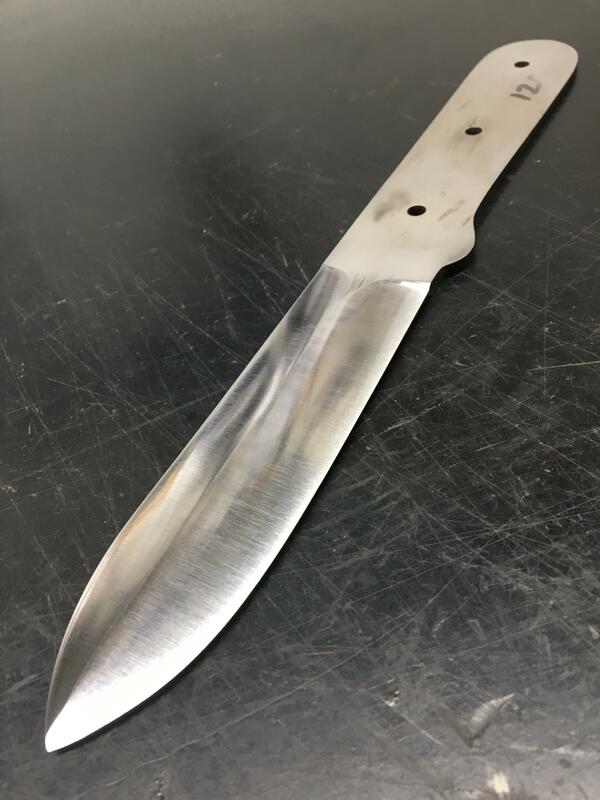 1 blade needs a bit more work before heat treat -- it's a little thick, currently. I haven't forgotten, wolfy, but thanks for the reminder. Haha. Spinner things...That's funny stuff, wsdstan! LOL! Thanks, Vik! I appreciate your tips on improving #3. I think I have the tapered tang where it needs to be. 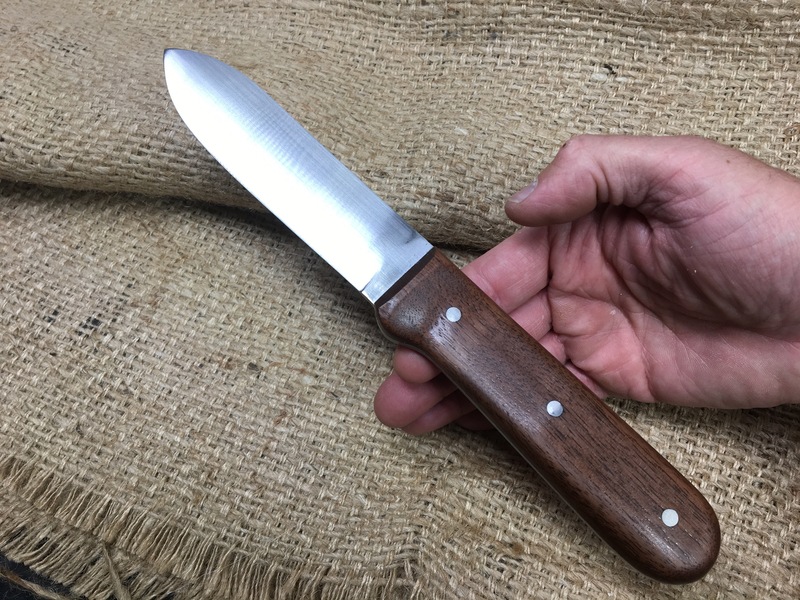 I've been pleased with the cutting performance of knife #2 and I got some positive feedback this weekend at Becker's Gathering. 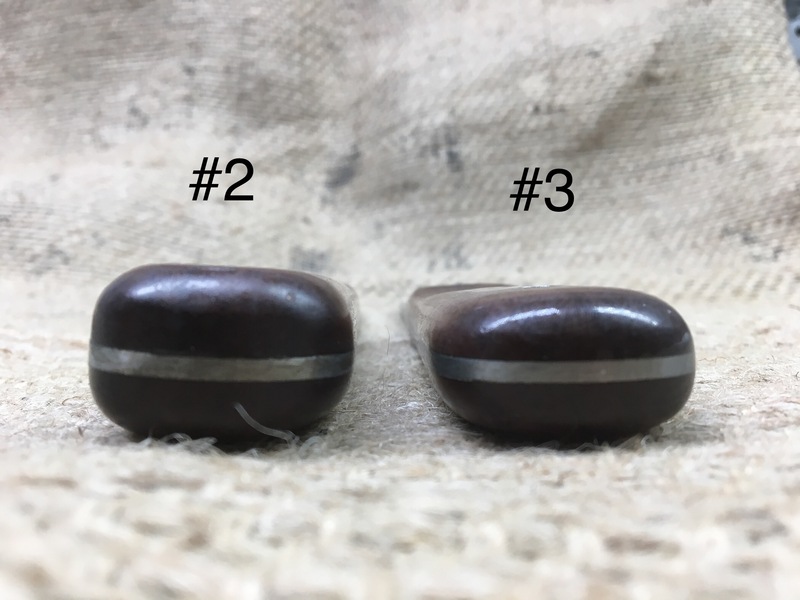 One of the improvements to #3 versus #2 will be the plunge line on the lower bevel. So far, I've started the bevels with a flat grind against the platen and cut a sharp plunge line. It then takes a lot of time and effort to soften it. I need to begin grinding with a softer plunge line and not have to work so hard to soften it. See #2 on top and #3 on bottom. Here is a peek at Kephart #3 - ready for some furniture. Cleaner plunge lines and I took the lower bevel down even closer to that zero convex. #3 should be a little better than #2 and a little closer to the 5 oz. weight of the Colclesser knife. Looking great Sarge. Thanks for the update. 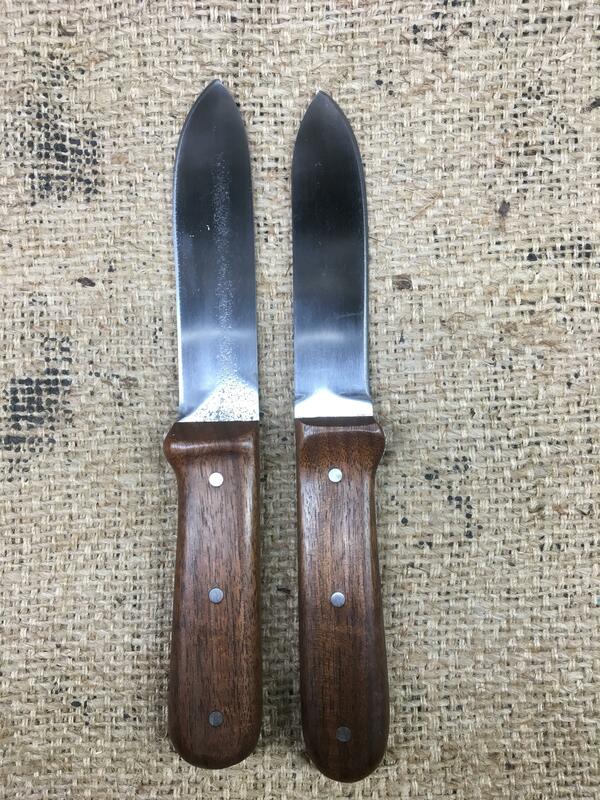 Not a lot of knife time lately but I've squeezed in a little time to work on #3. Still need to sharpen it but it's nearly done. Same dimensions as #2. Black walnut scales again with Tru-Oil finish. 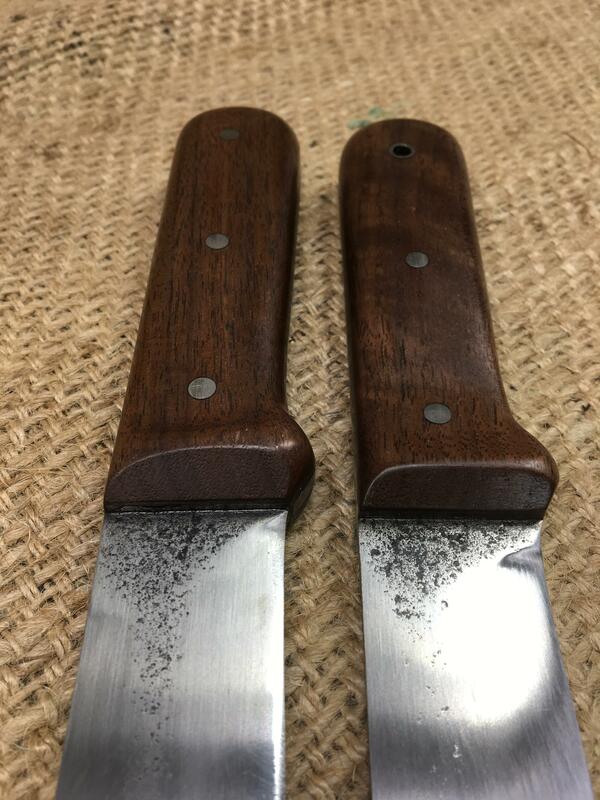 Primary difference in #3 (foreground) and #2 (middle) is #3 has cleaner plunge lines, the scales are thinner, and the tang taper is more symmetrical - thanks to some tips from 1066vik. but the handle thickness on #3 is a little closer to the original. I've got two more blanks from the same sawblade as #2 and #3. Hopefully #4 and #5 will finish up a little closer to the original. They're lookin' better all the time, Sarge! What's the story on that lanyard hole in #3's handle? Colclesser Brothers Deluxe model perhaps? Thanks, wolfy. Just playing around and added the lanyard tube instead of a pin but that's a good idea. The Deluxe Model will, of course, cost a lot more. Hahaha. They all look good. No. 3 is very nice. The progress and changes have been a lot of fun to watch and see Sarge, you're doing great with these!! Maybe I'm wrong, eh? And perhaps not on ALL of them, but maybe a stray every once in a while doesn't hurt too much. Thanks, guys! As always, I appreciate the feedback. No, Dano, I don't think that's way off base. I added the lanyard tube to the second one from the saw blade to make it a little different from the first sawblade knife. I have two more blanks from the same sawblade so a mosaic pin on one is a good idea to make it different. Hope it is ok if I steal your idea? I put the cutting edge on #3 tonight. It's a hair popper! Very well done Mr Sarge. Personally I like the simplistic style of no spacers, no lanyard hole, no mosaic pins, etc, but then again, some deluxe models will be just as fine as well. ME, TOO. Give that man a cigar!